Since moving to Devon 18-months-ago we are guilty of hugging the coastline for a lot of our adventures and mini-breaks. Who can blame us with more than 200 miles of beaches, rocky coves and cliff walks to explore? But what about inland Devon with its rolling moors and ancient forests? 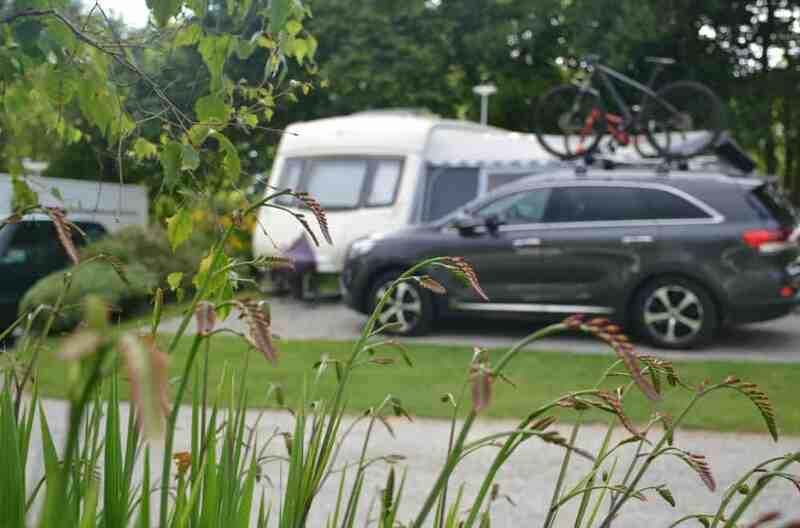 Last month we had the opportunity to find out what we’d been missing when we were invited to review Woodovis Park – a five star, Visit England award-winning campsite near Tavistock in Devon. If I could sum up this campsite in three words they would be: peaceful, immaculate and welcoming. Despite visiting on a weekend when every pitch was taken we found the site to be quiet and relaxed. The leafy setting and surrounding countryside views played a large part in creating this chilled-out atmosphere. Woodovis Park is a small yet perfectly formed site offering all types of camping options. We brought along our own touring caravan, Tin Box, for the review but could have pitched up a tent or opted for a touch of luxury in one of the camping pods. Then at the top end of what I class ‘camping’ there’s luxury holiday homes and a self-catering cottage with all the mod-cons of home. Our all-weather pitch in the quiet Tamar View field was immaculate with gravel hard-standing, edged with mown grass, and a shrub boarder giving privacy on one side. We had a 10A electric hook-up, as did every camping pitch onsite. Super pitches were also available with a 16A hook-up, their own water, grey waste and TV aerial points. Behind our caravan was a field which one of our neighbours – a regular Woodovis visitor – said sometimes contained sheep. In front of us was a large open area of grass before another row of vans and motorhomes. Thanks to Hawkshead for sending me this lovely Craghoppers dress – it’s cool and practical for our caravanning adventures. Oh, and who knew outdoor clothing companies could ‘do pretty’?? Beyond the Tamar View field was a woodland where we found signs telling us about local wildlife, as well as a den building area, and the lower meadow dog-walking field, bordered with wild flowers. This proved a great place to let the girls and Tin Box Dog to run off some steam after we’d set up. But the outdoor facilities don’t stop there. On the way back up towards reception there’s a field for ball games with a covered pétanque court and outdoor table tennis (bats can be loaned and balls purchased in the games room). This is also where we also found a posh looking bug hotel, which the girls delighted in for all of 30 seconds before tiring of looking for insects. If the bugs were sensible they were well hidden from my two! If you’re into cycling you can hire electric bikes from the site. One of the highlights for the girls was visiting the 11.4m indoor swimming pool. Taking a dip was made simple with two large family changing rooms and storage boxes for our things by the pool. Mr TB and I also took turns to test the spa pool and infrared sauna. It made for a very relaxing way to end each day and was relatively quiet considering the site was full. There isn’t a children’s splash pool, so make sure you bring arm bands or float suits for non-swimmers as the pool is 1.35m deep. Next to the pool building is a small playground with a play house, tree house and slide, swings and tractor – perfect for burning off any last energy reserves post-swim. Older children will enjoy escaping to the small games room next to reception where we also found lots of leaflets about things to do in the area. During peak season the Park also lays on family activities like water-walking, archery, circus skills and story-telling. The site shop has a small selection of camping essentials. Fresh bread, croissants and pain au chocolat are baked onsite every day. Just order what you like the night before. I can highly recommend the croissants, which I think were better than the ones I on a French campsite a few weeks before! We didn’t use the toilet blocks but I did pop my head into the space-age toilet cubicle for the glamping pods and main block next to reception where tents pitched. Both were very modern and clean with posh hand wash and hand cream. Mr Tin Box was extremely impressed with the waste disposal point where he found hand washing facilities to use after emptying our loo. He even went as far as saying it was the best elson point he’s ever used. These things count to caravanists! For those staying longer there was a laundry with washers, driers and an ironing board and iron. There was also an old red telephone box where you could find maps for local walking and cycle routes. The whole site was very well maintained and thought out. I really couldn’t fault it. The owners are obviously campers themselves and have used their experience to make Woodovis Park the best it can be. The information we received from Woodovis in the run up to our stay was so handy. As well as details of our booking they sent us ideas for things to do in the area including discount offers for attractions and a run down of when the local award-winning take away would be visiting the site. There’s dog poop bags and bins at the entrance to the woodland area off the Tamar View area and a dedicated dog and boot washing tap. We visited Tamar Trails during our stay. This is just five minutes down the road and is a great family day out with trails for walking and biking, plus tree surfing, canoeing and a lovely cafe. Look out for my full review soon. Just across the border into Cornwall we walked around the Cotehele estate, which is run by the National Trust. I’ll be writing about our visit there too. Other places to see with kids are the Morewellham Victorian village, Dartmoor Zoo of ‘We bought a zoo’ fame, and the beautiful market town of Tavistock. Nightly pitch fees range from £26 to £43.50 depending on the season and grade of pitch you choose. There are then additional fees for the number of people in your party, dogs, awnings, pup tents and extra cars. Our three-night stay at the end of June 2017 with a touring caravan, awning, two adults, two under fives (free) and a dog would have cost £108.75. For all the latest availability and pricing for Woodovis Park, visit its website. Have you visited the Tamar Valley and Dartmoor? I’d love some more recommendations on things to do and places to stay inland in Devon. Disclosure: we were invited guests of Woodovis Park and received a complimentary stay in exchange for a review. All opinions are my own and those of my family. Yep, absolutely! The pool was definitely hotel standard! It is! We have a lot more exploring to do here! It was great and empty out of the time we were there! It was brilliant. Particularly at the end of a busy day sightseeing! Thank you! We feel very lucky to have these places close by. Absolutely, its a lovely site and a great location too. The communication from the campsite in the lead up to the trip sounds AWESOME! I’ve had a few bad experiences here in the states that an email could have easily solved. Plus all the amenities and the fact that they provide the dog poop bags makes the owners sound like the most considerate campground owners ever!